The basic idea behind Self-Sustainable Station for Monitoring Extreme Environments (S3ME2) project, is to develop a device able to monitor a series of critical environmental parameters and provide a steady flux of real time measurements to be analyzed. The aim is to count on a reliable instrument which can be working autonomously for long periods of time, (eventually, during an unlimited period, hence its name), and which can be applied to a variety of studies. S3ME2 started its course with a 0 version (formerly Perpetual Environmental Station -PES-), which was tested last July 2016 in Iceland during a field site campaign. At that first occasion, the feasibility of the idea and the expectable performance of the prototype could be initially checked. Now, thanks to the funds awarded by Per Bengtssons Foundation, it will be possible to build the improved S3ME2 prototype, which will mean a great step towards the attainment of the expected definitive device. In particular, the operations of S3ME2 will take place again in Iceland, and are programmed to get insights into the investigations of earthquake precursors, apart from providing information for the further development of the device itself. 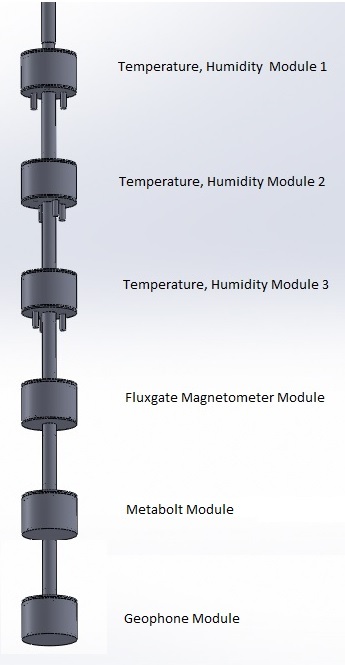 Temperature and Relative Humidity sensors. In addition to these modules, which are those to be buried under the ground level, S3ME2 counts on a detector for measuring ions in the air (both positive and negative) placed above the surface together with the electronics and communication system containing box. The increase in the amount of ions in the air is one of the earthquake precursors, so the counter is specifically dedicated to support the study on this matter by providing field site confirmation of such an increase, so far mainly stablished through lab experiments. Of course, one of the main problems posed by a device proposed to work eventually during an endless period of time, is the need of a steady and reliable power supply. S3ME2 is provided with a set of high capacity batteries fed by solar panels and a wind generator, in order to assure a constant provision of energy under any foreseeable environmental conditions. The measurements will be delivered via internet in real time through a dedicated communication system, and an analysis protocol has been implemented to get instant information from the data gathered. Finally, it must be remarked that the Module 4 includes an experiment which will contribute crucial information about conductivity through the soil in support of the calibration of HABIT.